David Gadbois did an interesting review of the new Acer GD235HZ/GD245HQ 120Hz display and its use along with Nvidia’s 3D Vision, but focusing on using the display for stereoscopic 3D photography and he sounds quite satisfied with it. 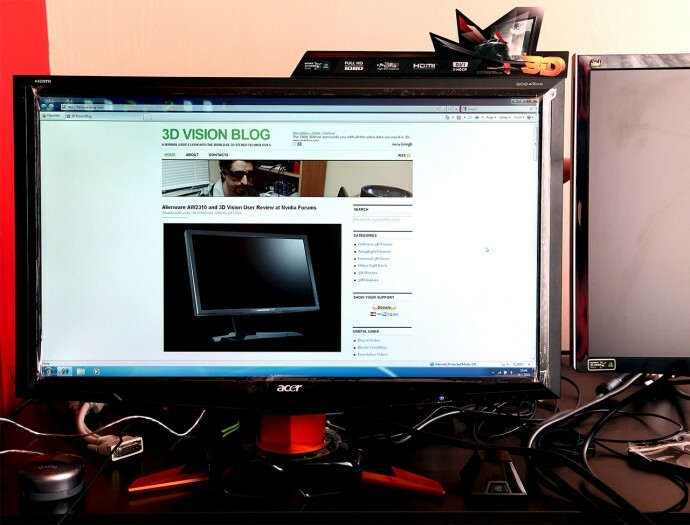 So if you are interested in mostly viewing stereo 3D photos with this new 3D-ready 120Hz Full HD monitor you should check what Dave has to say about it, also don’t forget to read my review of the monitor which is focusing mostly on gaming performance compared to the first generation models. If you’ve already watched the unboxing video of the Acer Aspire GD245HQ (same in terms of hardware as Acer GD235HZ) display you should know that I’ve been testing the 24-inch (23.6″ to be exact) Full HD display that is 120Hz and 3D Vision compatible. The expectations for this display are quite high, especially after the release of the Alienware OptiX AW2310 that did not provide a completely problem free 3D gaming experience (or so I’m reading, haven’t tested it personally) as we all hoped it would as it being in the next generation of 120Hz displays. This does not mean that the Alienware or that the Acer are not better in terms of what they offer to the user and in general compared to the previous generation of 22″ displays, but also does not mean that the fulfill every expectation consumers had… probably we just expected too much to happen in too little time. 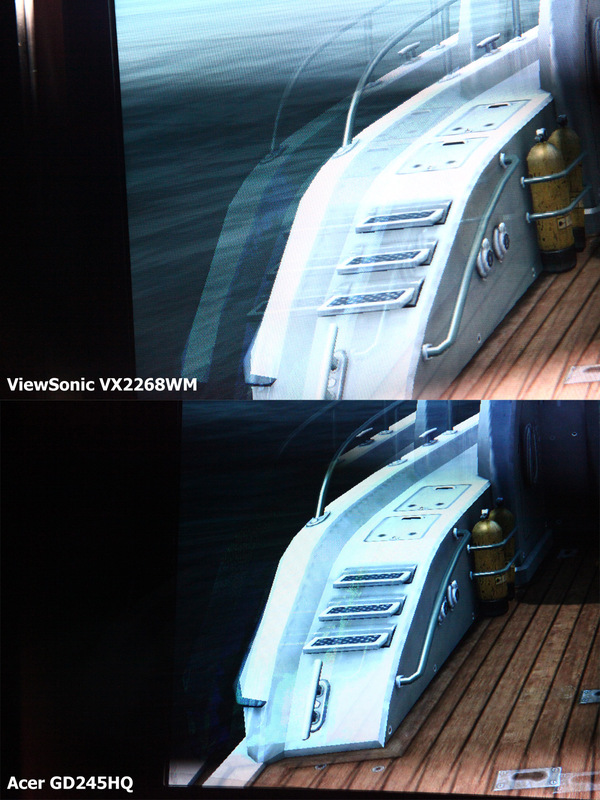 Anyway both Alienware and Acer make a good step towards better S3D experience, but lets get back to a more detailed look on the Acer GD245HQ that I’ve tested and compared to the 22″ ViewSonic VX2268WM and Samsung 2233RZ (the first generation 120Hz models). Note that the above official specifications do not mention anything about built-in speakers as the monitor does not have such (and why would it need), although it seems at some places selling the display you can see speakers mentioned. This is a bit misleading and the seller had mistaken the presence of a stereo audio jack on the display and cable in the kit thinking there are built-in speakers, but it is a completely different thing. Since the monitor has an HDMI and this allows you to pass audio through it, but you probably wouldn’t want to hear it through some crappy built-in speakers you have the option to output the audio from the HDMI to a decent set of external speakers. And the stereo cable is for just that, to output the audio passing through the HDMI (if any) to an external speakers, and it is clearly not for built-in speakers as there are no such in the display! The display does come with DVI-D, DSUB15 and HDMI connectors, but you can use the 2D/3D mode in 120Hz only on the Dual-Link DVI. There is a Dual-Link DVI cable and an analogue DSUB15 video cables, bundled with the monitor, there is no HDMI cable, but as I already said you cannot send more than 60Hz as an input signal to the display through HDMI or DSUB15. Apart from that there is the audio out cable (for HDMI audio output) and of course the power cable, the expected manuals and a CD with documentation and control software for the display. The external look of the Acer GD245HQ is quite nice, mostly black with just a little bit or orange on the monitor stand. And not to mention that unlike the 22-inch ViewSonic and Samsung displays here with the Acer, the stand is much more stable preventing the monitor from starting to swing around at the slightest vibration of your desk. A bit of a disappointment for some people might be the lack of height adjustment in the stand and that is kind of reasonable, especially having in mind that Acer’s display is with aspect ratio of 16:9 as compared to 16:10 for the ViewSonic and Samsung. 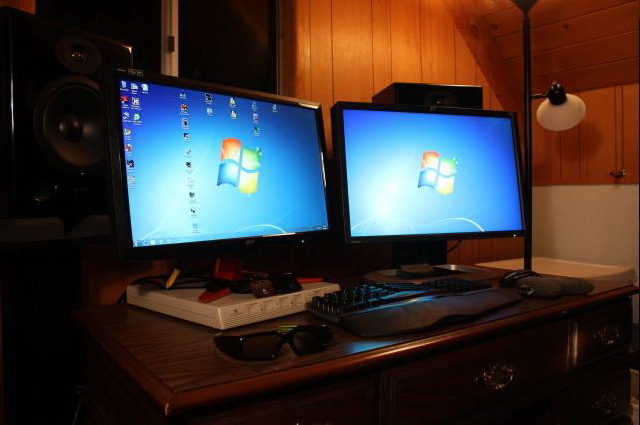 This might not seem too significant, but when you compare a 22″ and the 24″ monitor side by side they do not seem very different in terms of size at first look, the ViewSonic is even a bit higher as you can see on the picture above. For me personally the 16:9 is better for stereoscopic 3D gaming as there is the wider aspect gets better coverage for the peripheral vision, but this might differ from person to person and it seems that people even want 1920×1200 displays with 16:10 aspect. And now of to the bleeding of the LCD panel of the Acer GD245HQ. 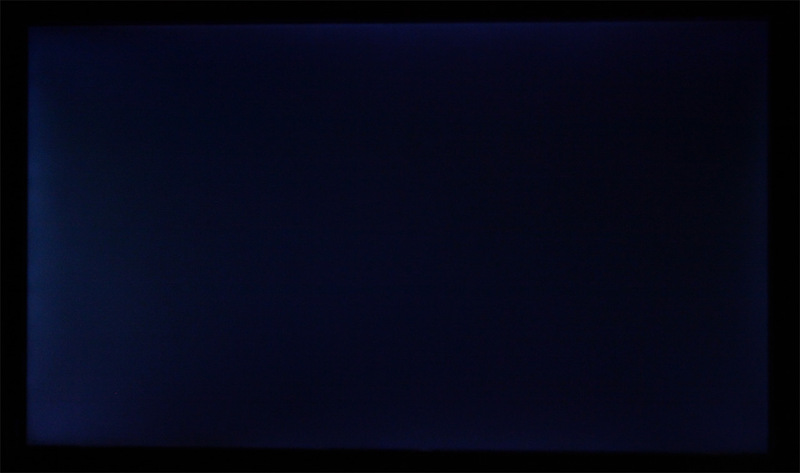 The above image is taken in a dark environment with the display showing a completely black image with a camera set a very high ISO and afterwards the image has been processed with an image editor just to enhance the visibility of the bleeding. In reality there is not that much light passing through the LCD panel from the backlight, but you can clearly see that the most light bleeding is coming from the left side of the panel, some from the top and just a bit from the right and bottom parts of the screen. Now, don’t think that there is no bleeding on the first generation of 120Hz displays, there is as there is on a lot of other monitors. On the picture above you can see that the ViewSonic display has the most bleeding coming from the bottom part of the screen and some from the left top. 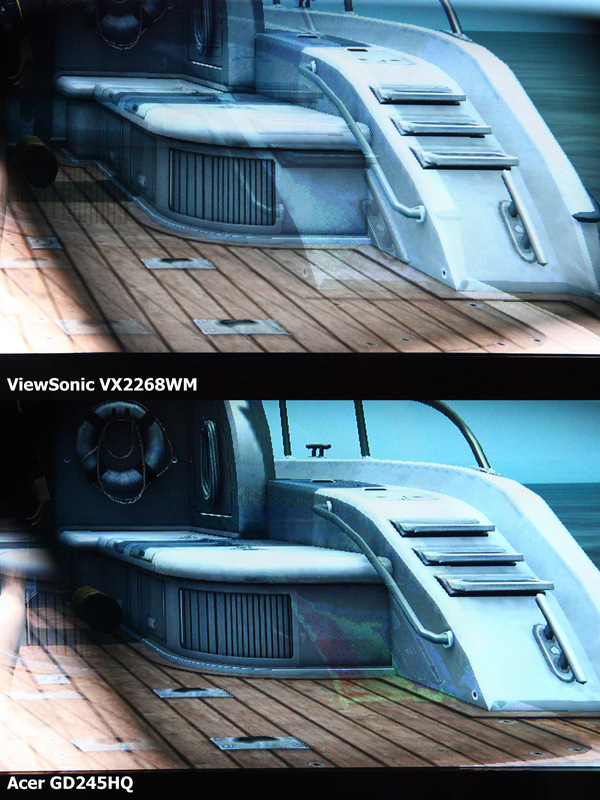 This picture comparing the Acer and ViewSonic displays next to each other has not been enhanced in an image editor, just shot with high ISO settings on the camera. As you can see the light bleeding here is less apparent and it is still more visible than what you’ll probably see with a naked eye directly looking at the display. In order to get more uniform backlight and less bleeding we’ll have to wait for the first 3D-capable displays to come out that use LEDs for backlight, but this also does not guarantee better results… it still depends on how good the implementation is. I’ve noticed something else you can see on the pictures above – the weird red/green ghosting that rarely appears on some images, it is probably related to some specific colors present. The both Ghosting comparison images were made from the game Tomb Raider Underworld on Lara’s boar before going underwater, but there are some other games and scenes where you can see the same strange ghosting. I’ve also seen it present for a brief moment on some videos, but I believe that this is something related to software issues and thus can lets say be fixed with a driver update for 3D vision for example. The above images are sent to Nvidia and lets see if they can figure out what is the issue and provide us with a fix, but as I said the above issue is rarely seen and you might not even notice it if you are not playing enough attention. 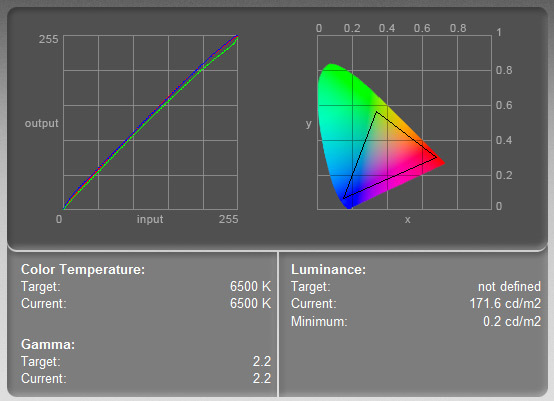 And now off to some measuring of the Acer GD245HQ with the help of an X-rite i1 Display 2 colorimeter. Calibrating the display colors does bring a bit of improvement in color reproduction (we are talking about a TN panel after all), but the most serious area where we have trouble with colors still remains – the very dark areas. There are not that much adjustments being done to the primary colors and the color reproduction before and after calibration changes just a bit – there is not a big difference. The brightness level after calibrating however might be an issue, as you can see the display brightness measured after calibration was just 171.6 cd/m2 and that is not that very good for when you wear the 3D Vision shutter glasses and play in S3D mode as there is an additional brightness drop. The maximum level of brightness I was able to measure was about 240 candelas per square meter which is still a bit less that the 300 cd/m2 stated in the specifications. The black level was measured to be about 0,2 cd/m2 which in turn resulted in quite good contrast ratio of almost 900:1, which in turn with the good sharpness of the display makes it noticeably better performing especially when watching videos in 2D or stereo 3D. Even when setting up the max brightness the display still manages to maintain a contrast ratio of about 900:1, so you don’t need to worry too much even if you play in stereo 3D mode with maximum brightness. After all by wearing the 3D Vision shutter glasses you are loosing some of the light and the black seems darker and closer to true black and the lightest objects are not so light anymore. The next important thing for every gamer is the input lag, or at least it should be, no matter if the games will be played in 2D or S3D mode. In my last input lag tests I was able to confirm that the 120Hz Viewsonic has little to no input lag compared to a good CRT monitor, so how well does new 120Hz Acer GD245HQ compare to that, you can see on the video. Use the pause button to compare the numbers on both displays, the video is shot with a camera recording at 240 fps which is more than enough for the displays 120Hz (120fps). Slower response (lower number of milliseconds) means input lag (delay) of the image because of the processing before being show on the screen. The Acer shows from zero to about 15-16 ms delay compared to the ViewSonic, but have in mind that both displays are running a clone image (using DVI splitter) with resolution of 1680×1050 which is not the native one for the Full HD Acer display! The next video shows the top/bottom screen ghosting issue on the Acer. As in the first generation of 3D capable 120Hz displays the second generation Acer GD245HQ still has some ghosting at objects show on the top and bottom parts of the screen as opposed to seeing the same object in the center part of the screen. Notice the shadow in front of the wind turbine in the video when it is being moved to the top or bottom parts of the screen. But generally as the ghosting is less on the Acer the top/bottom ghosting is also less. This here is another interesting effect that I’ve noticed in the game Borderlands, look at how if you leave the cable onscreen and then move a bit there is an afterimage left for a bit that fades in another moment. This issue is also present on the 120Hz ViewSonic displays, but it takes more time with with the cable static on screen for the afterimage to appear. So far I’ve noticed this only in Borderlands, so it might be something related just to that game, but it is there and it handles differently on both 3D displays. The above is of course visible when you shoot the video through the shutter glasses in S3D mode, not when you look directly at the screen without them. Also watch the HD version of the clip to see it more clearly! Another thing to note is that the “grainy texture” or more like a scanlines look (brighter lines) that could be seen on some scenes when in 3D mode on the first generation of 120Hz screens is now gone, or to be more exact much, much, much… harder to notice, so it should not bother you anymore, if it was bothering you on the ViewSonic or the Samsung displays.